In anticipation of the NRA annual meeting later this month, Ruger has given us a sneak peek at some of their new offerings. We’ll get our hands on them at the meeting in Indianapolis, but in the meantime here’re the details. First the American Rimfires, followed by the AR Pistol, then the Hawkeye Alaskan big game rifle. Go open your gun locker — I bet most of you have a Ruger 10/22 in there. Ruger is the undisputed king of rimfires, but their American Rimfire Target series is a huge step above the venerable 10/22, although it’s compatible with the ubiquitous 10/22 magazines. And they just updated the line with 416 satin stainless steel barrels, and a laminated thumbhole stock or an Alexander Henry forend. They’ve got the Marksman Adjustable trigger, and the 18″ barrel is suppressor ready with 1/2″-28 threads. It comes in .22 Lr, .17HMR, and .22 WMR with the MSRP sitting at $529, or $579 with the thumbhole stock. It’s a mil-spec AR pistol chambered in 5.56 NATO with a 10.5″ barrel (1:8 right-hand twist). The adjustable SB Tactical SBA3 Pistol Stabilizing Brace adjusts the overall length from 25.3″ to 27.9″ when extended. Its 9″ free floating handguard has M-LOK slots and cutouts for weight reduction and it continues the Picatinny rail from the receiver for its full length. The receiver is forged 7075-T6 aluminum with a forward assist, dust cover and brass deflector. The barrel comes with 1/2″-28 threading for accessories and is furnished with a flash suppressor. It ships with a 30-round Magpul Pmag. It is not approved for California and Massachusets. MSRP is $899, and we’ll have specifics on availability after the NRA annual meeting. Ruger’s Hawkeye Alaskan is a hunting rifle, and it comes in big game calibers: .375 Ruger, .338 Winchester, and .300 WinMag. It’s got a non-rotating, Mauser-type controlled round feed extractor and a hinged floor plate magazine with a 3-round capacity. It features a black Hogue OverMolded stock that has a tactile feel and sure grip. The adjustable v-notch rear sight and white bead front sight come standard, and it also includes scope rings that mount to the rails machined into the action. Ruger’s LC6 trigger is also standard. Their Muzzle Brake System includes a radial port brake, but if you don’t want to use the brake you can replace it with the included dynamically balance muzzle weight so that the ballistics don’t change. At 8 lbs with a 20″ barrel, it might be a good option to take on a hunting trek through the Final Frontier. MSRP: $1,279. Specs follow the pictures. 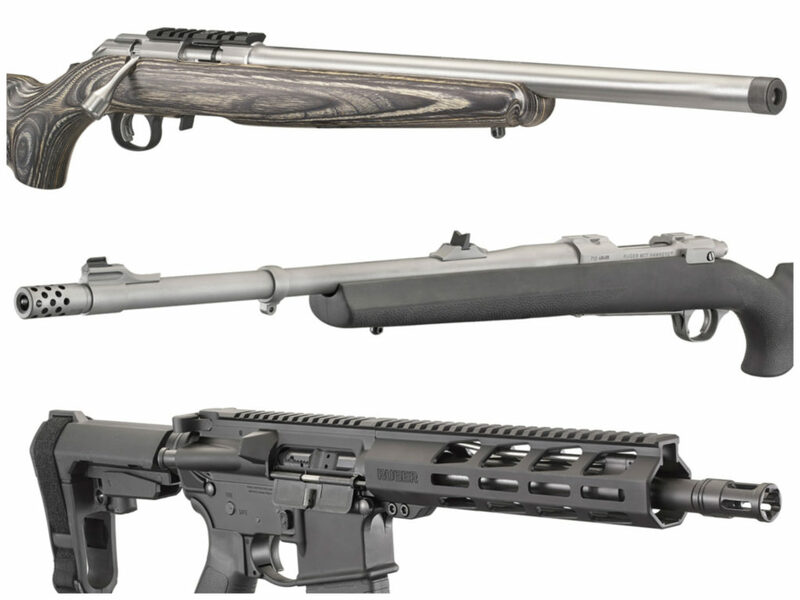 Visit Ruger.com to learn more about these new and updated models. There is a typo in the specs for the Ruger American, the caliber listed is .22 HMR and should read .22 WMR. I recently ordered a Ruger Mark IV 22/45 tactical in a desert yellow type of finish. Very Cool and must be somewhat new. All look good 308 ? How about a left handed bolt action 6.5 creedmore that box mag fed instead of that crappy rotary mag? I am a Nam vet that no longer has ten fingers. Loading a rotary mag for me is fustratingly slow and difficult. Right handers get to choose box or rotary but lefties are redheaded step kids when it comes to choice in Rugers eyes.